TORONTO, April 8, 2019 /CNW/ - Electrovaya Inc. ("Electrovaya" or the "Company") (TSX: EFL; OTCQX: EFLVF), invites attendees of the ProMat 2019 conference to visit the Company at Booth N6214. The conference is occurring from April 8-11 at McCormick Place in Chicago, IL. Electrovaya will display its battery system product line, which is currently powering several hundred Materials Handling Electric Vehicles. 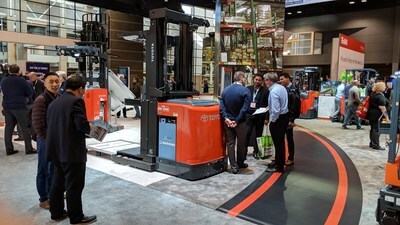 A forklift truck from Toyota will be on display at the Electrovaya booth, while the Electrovaya battery will also be on display at the Toyota booth. Electrovaya's batteries deliver powerful solutions for companies in the manufacturing, e-commerce, retail, distribution and supply chain logistics sectors, and offer industry-leading performance in terms of cycle-life, safety, energy and power. 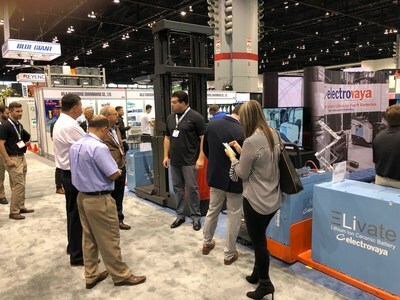 ProMat is the largest exposition in North America for manufacturing and supply chain professionals, with over 1,000 exhibitors demonstrating their material handling, manufacturing, and logistics equipment and technologies. The conference will feature over 130 sessions, including floor seminars, keynotes, and networking opportunities with leading industry professionals. Electrovaya Inc. (TSX: EFL) (OTCQX:EFLVF) designs, develops and manufactures proprietary lithium ion batteries, battery systems, and battery-related products for energy storage, clean electric transportation and other specialized applications. Electrovaya is a technology focused company with extensive IP. Headquartered in Ontario, Canada, Electrovaya has production facilities in Canada with customers around the globe. To learn more about how Electrovaya is powering mobility and energy storage, please explore www.electrovaya.com. 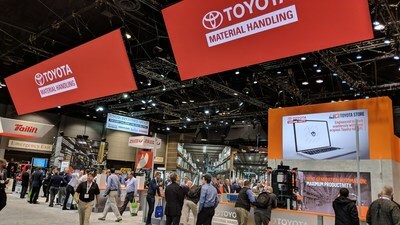 This press release contains forward-looking statements, including statements that relate to, among other things, the potential realization of revenue from the ProMat show or from other companies at the show, and, whether the Electrovaya display will expand Electrovaya's market reach, anticipated increased collaboration with OEMs in fiscal 2019, anticipated continued increase in sales momentum in fiscal 2019 through OEMs and directly to large global companies, including Fortune 500 companies, the Company's ability to source supply to satisfy demand for its products and satisfy current order volume, the Company's markets, objectives, goals, strategies, intentions, beliefs, expectations and estimates, and can generally be identified by the use of words such as "may", "will", "could", "should", "would", "likely", "possible", "expect", "intend", "estimate", "anticipate", "believe", "plan", "objective" and "continue" (or the negative thereof) and words and expressions of similar import. Although the Company believes that the expectations reflected in such forward-looking statements are reasonable, such statements involve risks and uncertainties, and undue reliance should not be placed on such statements. Certain material factors or assumptions are applied in making forward-looking statements, and actual results may differ materially from those expressed or implied in such statements. Important factors that could cause actual results to differ materially from expectations include but are not limited to: that current customers will continue to make and increase orders for the Company's products, and that the Company's alternate supply chain will be adequate to replace material supply and manufacturing. Important factors that could cause actual results to differ materially from expectations include but are not limited to: general business and economic conditions (including but not limited to currency rates and creditworthiness of customers), Company liquidity and capital resources, including the availability of additional capital resources to fund its activities, level of competition, changes in laws and regulations, legal and regulatory proceedings, the ability to adapt products and services to the changing market, the ability to attract and retain key executives, and the ability to execute strategic plans. Additional information about material factors that could cause actual results to differ materially from expectations and about material factors or assumptions applied in making forward-looking statements may be found in the Company's Annual Information Form for the year ended September 30, 2018 under "Risk Factors", and in the Company's most recent annual and interim Management's Discussion and Analysis under "Qualitative and Quantitative Disclosures about Risk and Uncertainties" as well as in other public disclosure documents filed with Canadian securities regulatory authorities. The Company does not undertake any obligation to update publicly or to revise any of the forward-looking statements contained in this document, whether as a result of new information, future events or otherwise, except as required by law.